“It’s Time to Push the Borders of Freedom”: Egyptian Students Defiantly Publish Newspaper Without Government Permission | Democracy Now! 17-year-old high school student in Cairo, Egypt. Democracy Now! senior producer reporting from Cairo, Egypt. AMY GOODMAN: Very briefly, Sharif, if you could introduce this young woman, this Egyptian teenager, and why you interviewed her, the significance of what’s happening today. SHARIF ABDEL KOUDDOUS: Well, Amy, you know, the youth here has been critical to this revolution. A lot of people here call it the revolution of the youth, while they first took to the streets, but they were joined by all Egyptians eventually. And they are really taking some of the boldest steps in this uprising, going forward. And what they have done is, I’m holding in my hand here the first edition of a newspaper that’s called El Gornal, which just means “newspaper” in Egyptian Arabic. It just means “journal.” It’s kind of our word for it. And they have printed it, and they’re distributing it online. It’s basically voices of protesters, and it also has a list of the martyrs in the back, of people killed in the revolution. But the reason that they are also printing it, in addition to putting it online, is intentionally to break Egyptian law, which bars the printing and distributing of newspapers without permission. So, this is Sanaa El Seif. She’s a high school student, and I spoke to her about this paper. SANAA EL SEIF: My name is Sanaa. I’m 17. I’m in my last high school year. We thought that right now is the very — it’s the perfect timing to push the borders of freedom further. So, we thought, “Why not? Let’s make a newspaper, and let’s not get permission for that. Let’s just sell it in the streets.” It’s a very symbolic thing. We are not counting on it. We don’t have like a big budget or anything. But we want to force this. We want to have like the freedom of expression. We want to force further. SHARIF ABDEL KOUDDOUS: So, usually you have to get permission to print a newspaper in Egypt? SANAA EL SEIF: Yeah, I think that’s the first time this will happen. So, we’ll see. 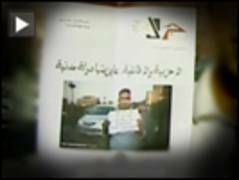 SHARIF ABDEL KOUDDOUS: And what kind of paper is it? Describe it. SANAA EL SEIF: OK, it’s called Voices of Tahrir, which is “liberation.” And well, we thought that the first copy has to be like, each one of us, after this experience of the revolution, has something to say. So we called everybody we know. We called people from Tahrir Square, people from Alexandria, people who have been there doing something in this revolution, and everybody wrote something. And we’re just — it’s like a blog. AMY GOODMAN: That’s Sanaa El Seif. And we’re going to go back to her next week, because we’ll be wrapping up our coverage with Sharif in Cairo next week when he comes back to our studio to bring us his final interviews there. Sanaa Seif, who is involved in this new newspaper that came out this week, El Gornal.